I was 15 years old when I was offered to have a pen-pal, or as they call it in Australia from where she hailed – a pen friend. My English was negligible, but with a lot of effort I composed a letter to a girl my age in the remote Australia. I waited for a long time and then her reply finally arrived. I was truly delighted and after the first letter I checked my mail-box daily. Approximately once every two months a letter was there for me. I always read, re-read and translated these letters for my family, friends, and classmates and could not stop bragging about that fact that I was receiving letters from Australia. I believe that at some point at least half of the little village where I lived knew about my letters from Australia. It was 1987, Latvia was occupied, a part of the Soviet Union, and our contacts with the outside world were practically non-existent. So a letter from a girl my age from Australia was especially exotic. That same year I was delegated by my school to participate in the “Olympics in politics”. My team won simply because I had mastered by heart a newspaper article about the annual Congress of the Communist Party in China. My interest in politics was so great that I was able to recite all the names of the leading Chinese communist personalities in that Congress that were cited in the newspaper and this really impressed the jury. But in truth, almost all of us soviet teenagers knew that most likely very little would ever change in our lives. Perestroika had just started and no one yet knew where it would lead. We were quite sure that most of us would live our lives much as our parents have including no real possibility of seeing the outside world, continually leading a double life in which you said one thing officially and then made cynical remarks about it in private, attended tedious official propaganda meetings, and had the same standard furniture in a small Soviet apartment as the rest of the neighbours. Lucky for my generation it all changed. Now, almost 30 year past these grey times, I have visited all the countries of the European Union, and have studied and worked in some. Latvia has now for 11 years been a member of the NATO and EU. We recently concluded our first successful presidency in the Council of the European Union and my 12 years old children have visited more countries than I at their age could even name. What was a wonder for my generation is a fact of life for the youth of today. But please do not take the opportunities that the European Union and the free world offer for granted! These are possibilities and values that we have to fight for each and every day. Now we see these values contested in the European Union on a daily basis. Mental and physical borders are reappearing, basic principles of the European solidarity are being disputed, at times there is bitter bickering among the European Union states about values and policy choices, and finally – the ugly phenomenon of terrorism is threatening our lives and infringing our freedoms. 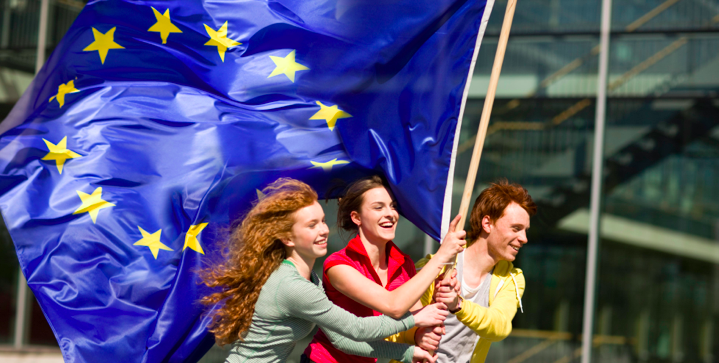 It is up to you, young Europeans, to carry the European project forward. My generation still knows the times when we were forced to have very different priorities, while your generation has Europe in your blood.